The Sherwood, Tigard and Tualatin high school football teams all got off to winning starts in postseason play. 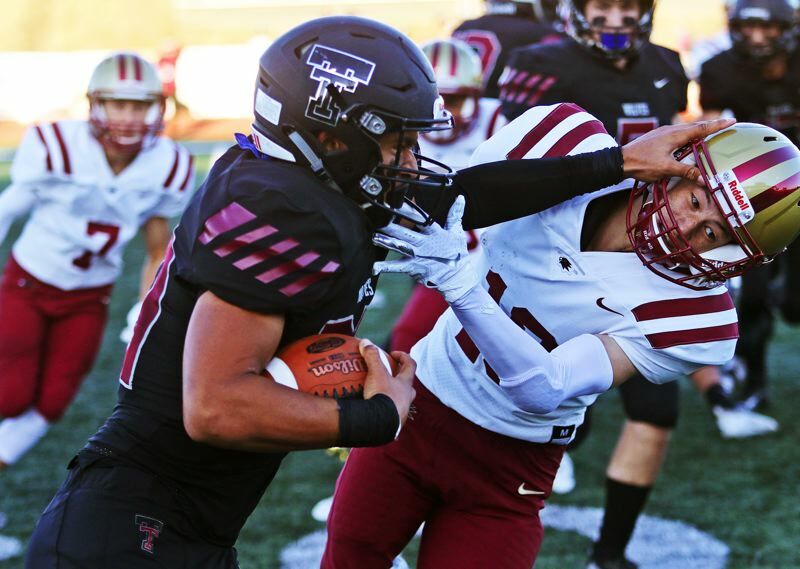 Now, the Bowmen, Tigers and Timberwolves will all look to make it two in a row, as they will compete in Class 6A state playoff second-round games tonight (Friday). Tigard will be at home, as it will host Barlow in a second-round playoff tilt starting at 7 p.m.. Tualatin will meet Central Catholic in a game starting at 7 p.m. at Hillsboro Stadium and Sherwood will travel to Eugene to face Sheldon in a 7 p.m. contest. Tigard will be facing a familiar opponent in Barlow. Tonight's meeting will be the third between the teams in a little more than a year. The Tigers and Bruins clashed in a state playoff first round game last year, with Tigard winning 42-35 at Tigard High School. The teams also met in a non-league game earlier this season, with the Tigers getting a 58-14 win back on Sept. 14. In the game earlier this season, Tigard senior running back Malcolm Stockdale rushed for 161 yards and four touchdowns on 23 carries. Tiger sophomore quarterback Drew Carter completed 10 of 18 pass attempts for 335 yards and three touchdowns, with one interception. Tigard senior receiver Jazz Ross had six receptions for 225 yards and two touchdowns. For Barlow in that contest, senior running back Jobadiah Malary rushed for 167 yards and two touchdowns on 10 carries. Malary, the Mt. Hood Conference Offensive Player of the Year, has scored 27 touchdowns on the season. Tigard, the No. 2 team out of the Three Rivers League, and the No. 5 team in the final OSAA power rankings, brings an overall record of 9-1 into tonight's playoff tilt. Barlow, the No. 3 team out of the Mt. Hood Conference, and No. 12 team in the power rankings, is 7-3 on the season. The Bruins have gone 7-1 since the earlier loss at Tigard. The winner of Friday's game at Tigard will meet either Jesuit or Reynolds in the quarterfinal round of the Class 6A state playoffs. 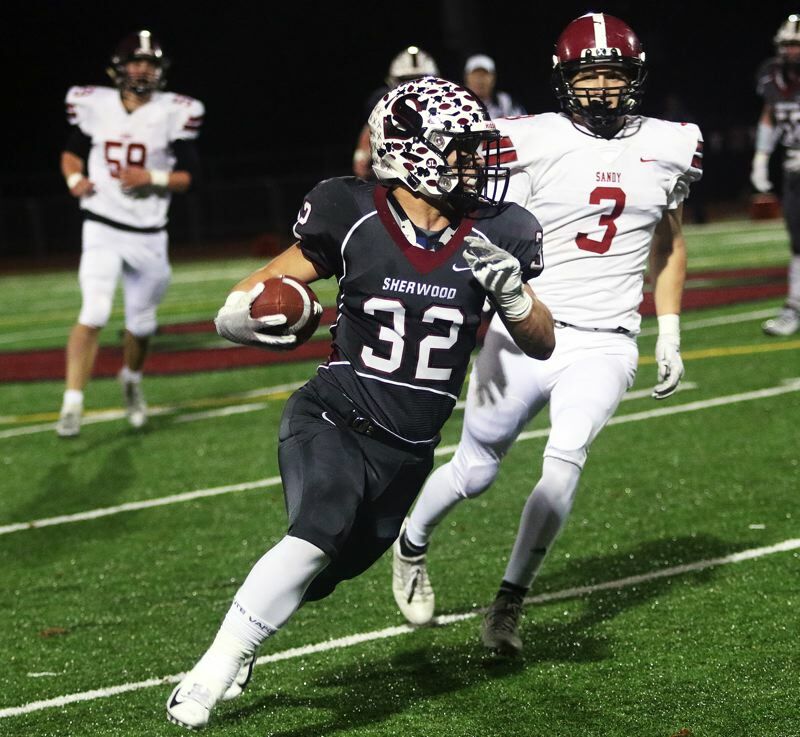 Speaking of the quarterfinals, Tualatin will be looking to get to the quarterfinals for the first time since 2010 when it plays Central Catholic tonight. Tualatin, the No. 5 team out of the Three Rivers League, and the No. 9 team in the power rankings, is 7-3 on the season. 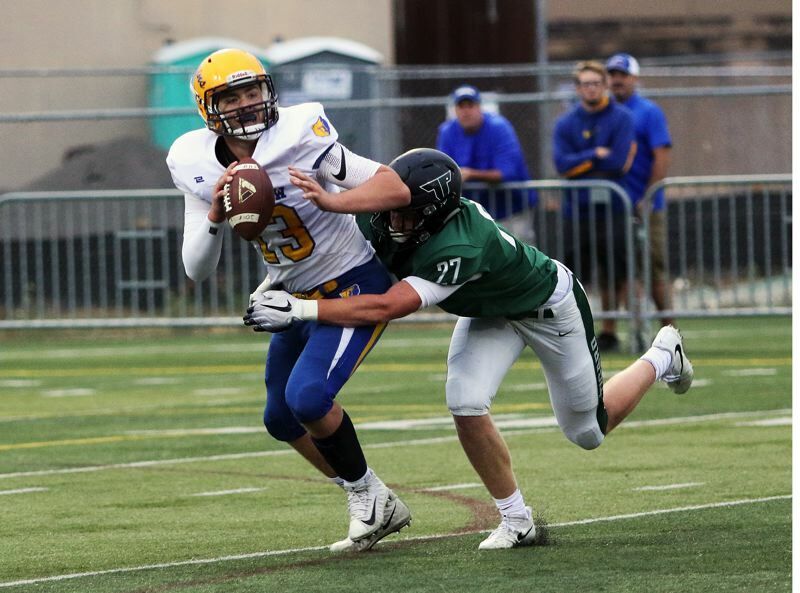 The Timberwolves ended a three-game losing skid — coming against strong teams from West Linn, Lake Oswego and Tigard — with a 49-20 first-round state playoff win over Mountain View of Bend last week. Central Catholic, the No. 2 team out of the Mt. Hood Conference, and No. 8 team in the power rankings, is 6-4 on the season. The Rams opened the state playoffs with a 42-28 win over Lincoln. Both teams in the second-round match-up feature some top-notch players. Central Catholic is led by junior quarterback Cade Knighton. Other top players for the Rams include junior receiver Silas Starr, junior running back Elijah Elliott and senior center Daniel Jefferies. Knighton, Starr, Elliott and Jefferies were all first-team All-Mt. Hood Conference selections. Tualatin features senior running back Dominique Loggins, junior tight end/running back/linebacker John Miller, senior receiver/defensive backs Caden Dickson and Jett Searle, senior fullback/linebacker Kyle Kamp, senior linemen Quinn McCarthy, Dane Norlin and Gavin Moore and a one-two punch at quarterback with senior Kyle Dernedde and junior Blake Jackson. The winner of tonight's game at Hillsboro Stadium will face either top-seeded Lake Oswego or Oregon City in the quarterfinal round. Sherwood looks to be facing a definite challenge when it plays at Sheldon tonight, but the Bowmen say they're up for that challenge. "We're hoping we can shock them, get another win and move on," Sherwood senior lineman Bryan Cuthbertson said following the Bowmen's 42-14 first-round state playoff win over Sandy. "We have to focus on practicing hard. Practicing 110 percent the whole time. I think Sheldon is a passing team, so we'll have to get pressure on the quarterback, and our DBs will have to be disciplined and do their roles." "Every once in awhile, you come up against big opponents, and we feel like we can compete with them, just like any other team in the state," Sherwood junior running back Jamison Guerra said. Sheldon, the Southwest Conference champion and the No. 3 team in the OSAA power rankings, is 8-2 on the season. The Irish feature senior dual-threat quarterback Michael Johnson Jr., who is a Penn State commit, and senior tight end Patrick Herbert, who is a University of Oregon commit. Sherwood, the No. 2 team out of the Pacific Conference, and the No. 14 in the power rankings, is 5-5 on the season. The Bowmen and Sheldon last met in the playoffs in 2014, when the Irish got a thrilling 35-31 win, stopping Sherwood at the goal line as time expired. The winner of tonight's game at Sheldon will face either West Linn or Lakeridge in the quarterfinal round.